The color navy is a fashion staple with its refined, elegant hue. Bring that sophistication to your own jewelry collection with this three stone ring from Apples of Gold. Two navy blue sapphire gemstones begin the beauty for the band, measuring 3.5mm each. A 0.25 carat white diamond is equally chic, set in the center of the sapphires. The precious gems are set in the round cut finish and mounted in timeless yellow gold. A flawless, buffed yellow gold continues the timeless style of the ring. 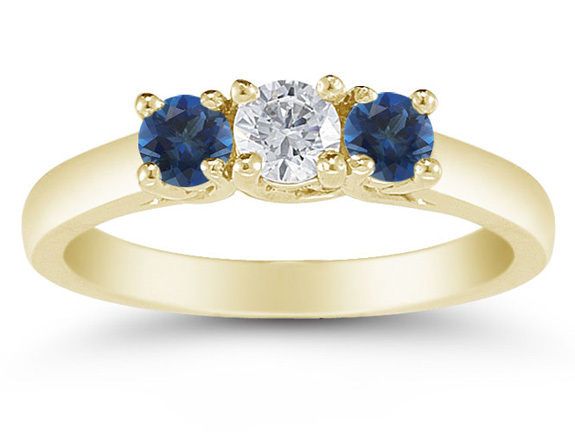 We guarantee our Three Stone Diamond and Sapphire Ring, 14K Gold to be high quality, authentic jewelry, as described above.